YouTube’s Mini player is live now. It will help users browse YouTube videos while watching. Let’s learn how to use it. A few months ago, YouTube started testing video multi-tasking feature for the desktop version. It is a function that helps users to keep watching while browsing other videos on YouTube. At that time, it was confirmed that the company would soon release the Miniplayer. YouTube has started pushing the new feature for its desktop version. YouTube Mini player is a ‘Picture in Picture’ for the desktop version. This will make it easier for the users to browse videos while watching the current one. The same feature is already available on the YouTube’s Android and iOS app. YouTube’s Miniplayer was first located by 9to5google. YouTube on Mac and Windows desktops both have this feature. No update is required to start using the Miniplayer. Note: With YouTube’s Miniplayer, you can browse videos while playing within YouTube and not for other web pages. 1. 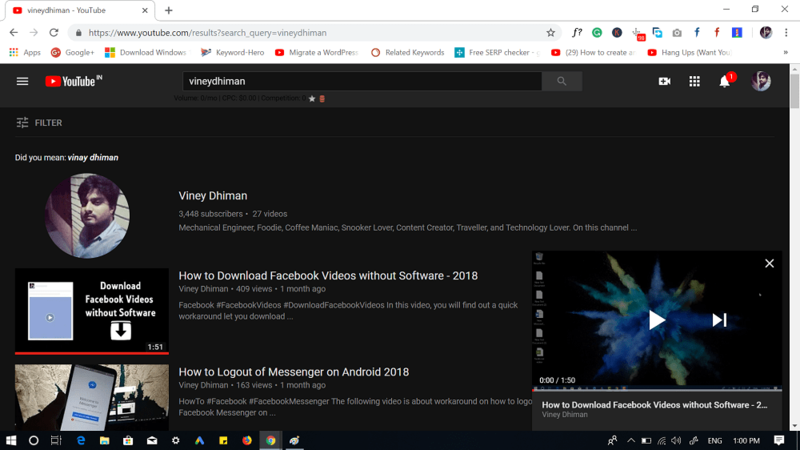 Visit Youtube.com using your default web browser. Since YouTube is part of Google, I recommend to use it on Google Chrome for better results. 2. Search and open the video which you want to play. 3. Once the video starts playing, head over to YouTube media player control bar. Here’s you will notice a new Miniplayer icon next to the Gear icon. Click on the Miniplayer icon and video will be shrunk to the bottom right corner of the screen. 4. Now you’re free to browse videos on YouTube. In the Miniplayer, you will only see the video title and channel name. Apart from that, you have the option to pause the video and skip to the next video. The good thing is that it also supports YouTube Dark mode. Now you might be wondering, how to exit YouTube’s Miniplayer, right? Click on the Close icon available on the upper right corner of the Miniplayer will do the drill. Also, if you start watching the new video, then it will also automatically exit the Miniplayer. In case, you want to switch from Miniplayer to regular mode, then click anywhere on the Miniplayer. The primary purpose of introducing Miniplayer in YouTube desktop version is to give users the power of browsing other videos while watching the current one. What are your thoughts about YouTube Miniplayer? Find it useful? Share your opinion in the comments.